The El Niño Southern Oscillation, more commonly called El Niño, is a weather pattern that occurs roughly every 4 years, though it can range from 2 to 7 years. 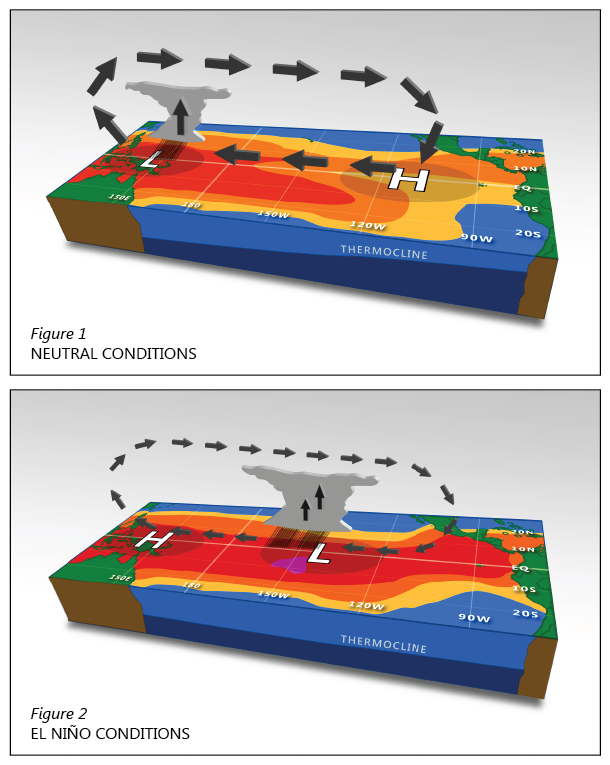 There are two different types of events: El Niño years are years in which the ocean off the west coast of South America near the equator is abnormally warm, and the air pressure over the western equatorial pacific is unusually high; La Niña years are the reverse, low water temperatures off the coast of Ecuador and low air pressure on the other side of the pacific. Because pressure and temperature are major drivers of circulation in both the atmosphere and the ocean, these changes disrupt the usual circulation and have global effects. These changes usually occur most strongly from December to April, affecting winters in the northern hemisphere and summers in the southern. For example, most of the United States will experience warmer, drier winters during El Niño, while California will have wetter winters and the southeast U.S. will be both wetter and warmer than usual. Similar patterns of unusual weather occur on every continent, and have been blamed for everything from droughts and wildfires in Australia to deficient snow for the 2010 Winter Olympics in Canada. 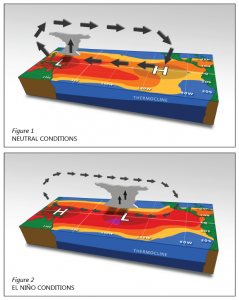 The interaction between El Niño and other elements of climate are poorly understood, leading to some scientists predicting increased severity of El Niño events as the world warms, and others saying not so. Research from the Coastal Systems Group has found links between El Niño frequency and hurricane activity, indicating that future changes in El Niño could affect storminess as well.